Dee Jay Bawden is an artist and professional sculptor. He is a member of The Church of Jesus Christ of Latter-day Saints. Bawden was born on January 12, 1951, and reared in West Valley City, Utah. He learned basic art concepts from his artist parents—his father was a wood carver and his mother was a painter. At age 13, he was asked to make a sculpture of his school’s mascot. Before the age of 18, he sold many bronze statues. He was considered for the Sterling Scholarship for art in 1969. He attended the University of Utah on a scholarship, but left after only two months when he didn’t agree with the instruction. He became an apprentice to Utah sculptor, Avard Fairbanks. Throughout the next decade he filled galleries with his Western, wildlife, and Native American sculptures. 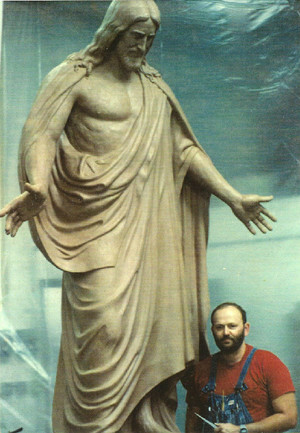 He was able to work full time as a professional bronze sculptor. By the end of the 1970s and into the 1980s, Bawden began to focus on religious statues and sculpted for many Christian churches throughout the United States, including his own, the Church of Jesus Christ. Bawden and his wife JoAnn had 14 children. She passed away in 1997. Bawden married Deana Johansen who has four children. This page was last edited on 19 September 2014, at 22:50.